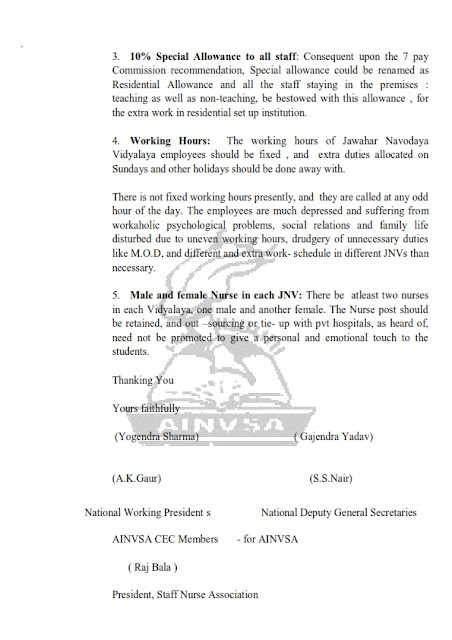 A modified list has been made as spread in the air for the representations received in respect of grieved employees especially the PGTs , and individual orders being sent to respective Vidyalaya emaid ids and Regional offices. 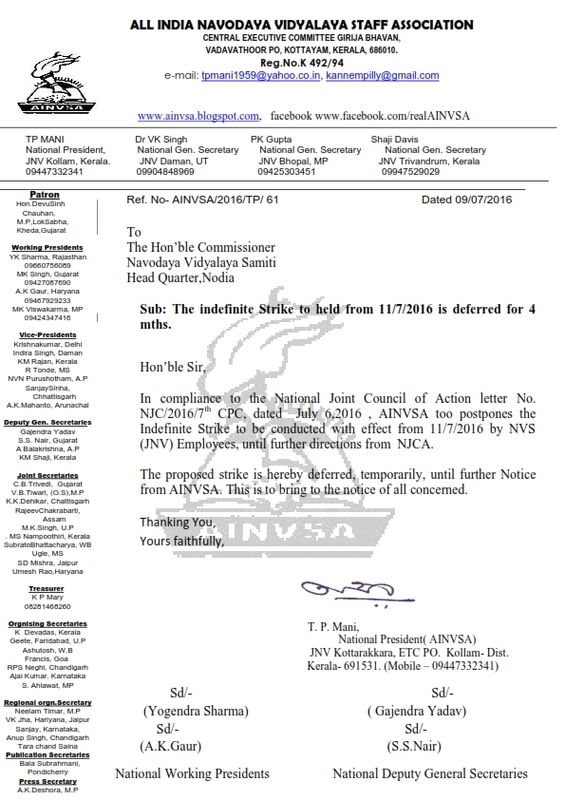 AINVSA requests NVS authorities to upload this list on the official NVS Hqr website to sustain the TRANSPARENCY image gained so fair in this Annual Transfer Drive 2016. 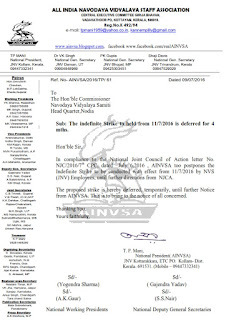 This modified individual transfer orders may be sent individually, but the list of this corrigendum should be made public, by uploading it in the site www.nvshq.org, for the display to the employees ...of sympathetic grounds , public interest or medical ground etc substantiated for. NVS ought to see the genuiness of the grounds, and a deadline to be put for the representation, limitation period to be executed or else the Transfer process would go on for two years. 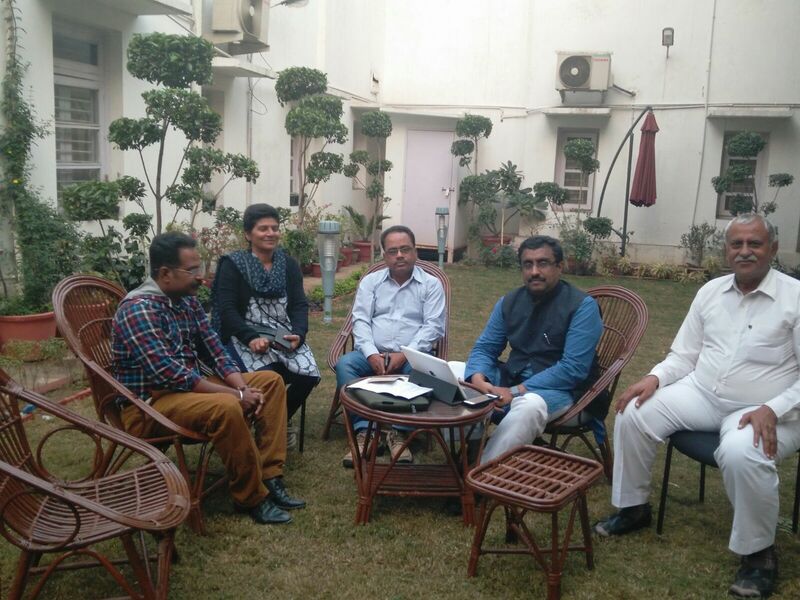 An AINVSA delegation comprising of Yogendra Sharma, S.S.Nair, A.K.Gaur, Gajendra Yadav and Smt Rajbala Yadav, President of Staff Nurse Association met the HRD MoS Sh. 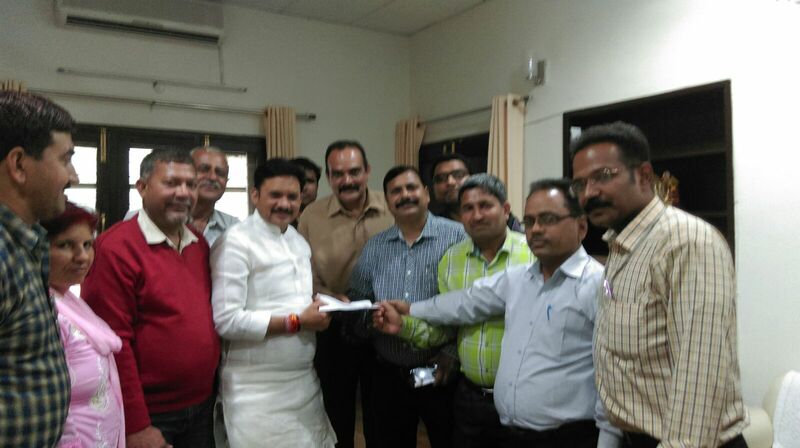 Kushwahaji and the Hon Commissioner, NVS on 29/5/2016 during the National Alumni meet of AIJAA., and handed over the Memorandum of demands, and Representations to them respectively. 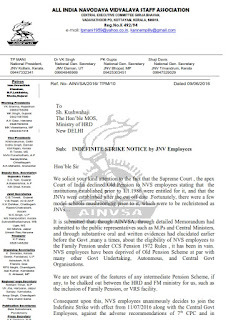 The JNV employees had seen a silver lining in the cloud when at least all the transfer data had been uploaded by NVS in their official website. And when the last year's pending list of N.E and Hard station list 2015 had been materialied and made functional by transfer orders to the respective Regional Offices by HQR letter dated 18/04/2016, a ray of hope was seen that the proposed list of 2016 would also soon be released, but it lingers on and on to the mental agony of the staff..
NVS need to upload any transfer related information being sent to Regional Offices in their official website to sustain the trust of the desperate staff... says the well-wishers of NVS, as there is nothing confidential or official secrets act matter... to not to be disclosed in this transfer issue. On the contrary , NVS need to be more transparent, articulate and disseminate all the information for the smooth implementation or executions of Transfers.. Delays, if any, be disclosed as well, in advance, to the mental relief of all employees. 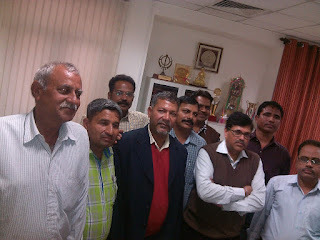 Suspense and speculations crepting in , are only creating unnecessary stress to the employees . Subsequently, many unseen repercussions to this effect seen at the Vidyalaya level..
Its high time that NVS disclose the Proposed Transfer list 2016, as there is still time to rectify the discrepancies found ,if any, in this list, as its a proposed one and not final. 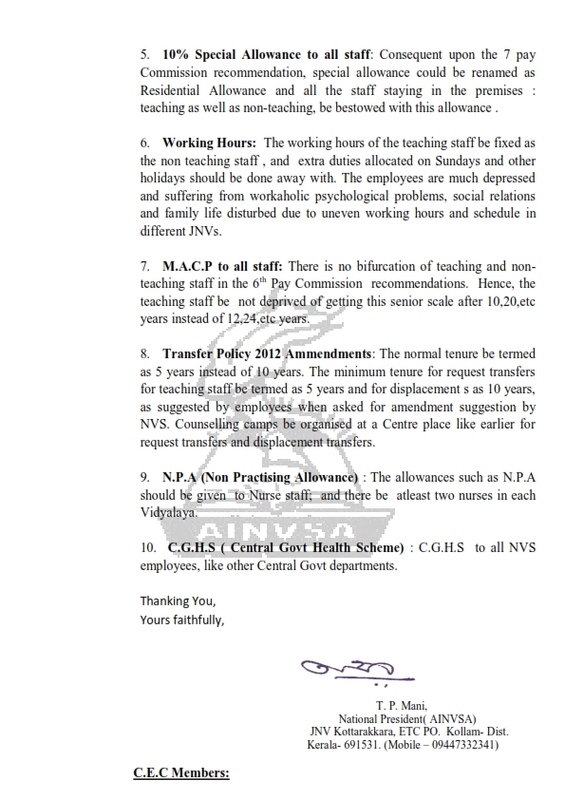 The staff wards admission, the closing of JNVs, the charges they are handling are related to this, and need contemplations before hand. 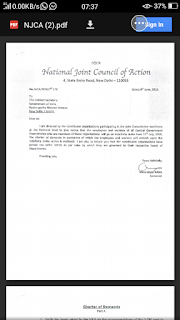 Hence, the transfer aspirants of 2015 are pleased that their list has been released prior to 2016. 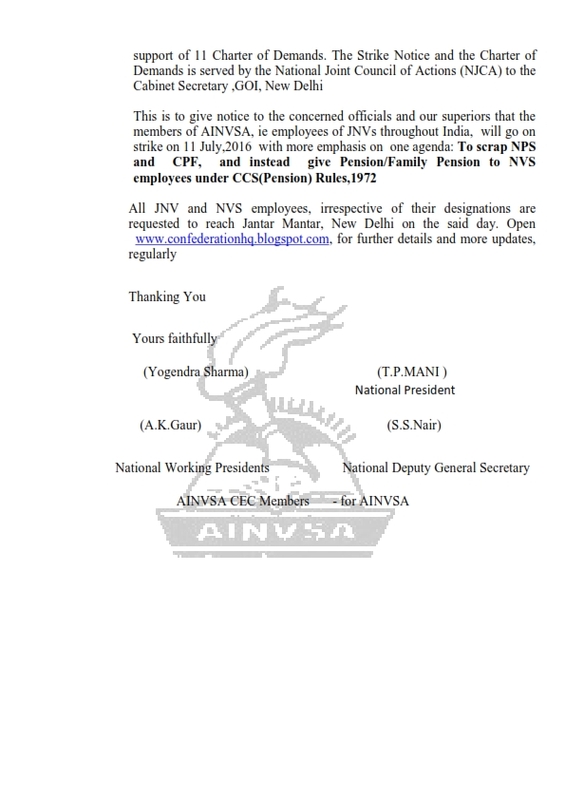 Hope NVS makes the transfer aspirants of Year 2016, also happy by releasing the list soon. 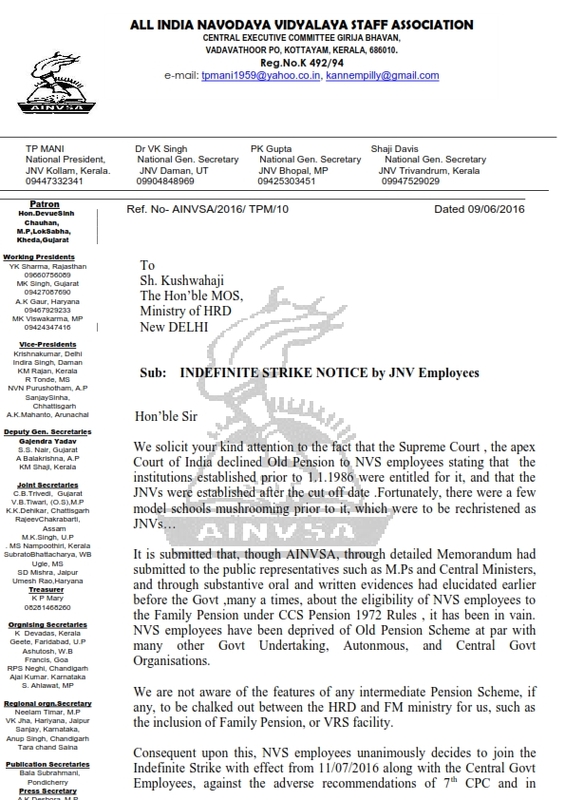 The JNVs are to be closed from 30 April,2016 in most of the Regions .If descrepancies found, could be representated through proper channels, and get it rectified if NVS releases Proposed List prior to 25 april,2016,positively. 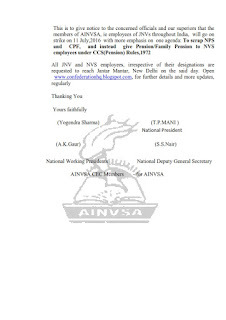 N.V.S humbly requested to display the orders issued to the Regional offices on its official website, in connection with transfer matters, to avoid unnecessary restlessness and check rampant rumours, in vogue, among the NVS employees nowadays for lack of proper information in this regard. 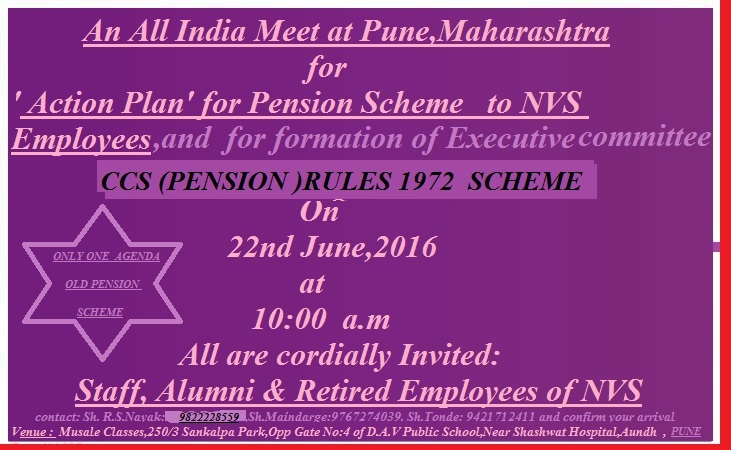 690 Jnv employees have already signed the online petition,as on 16/4/2016... Just fill a form, n click Submit the Petition. Hurry up. 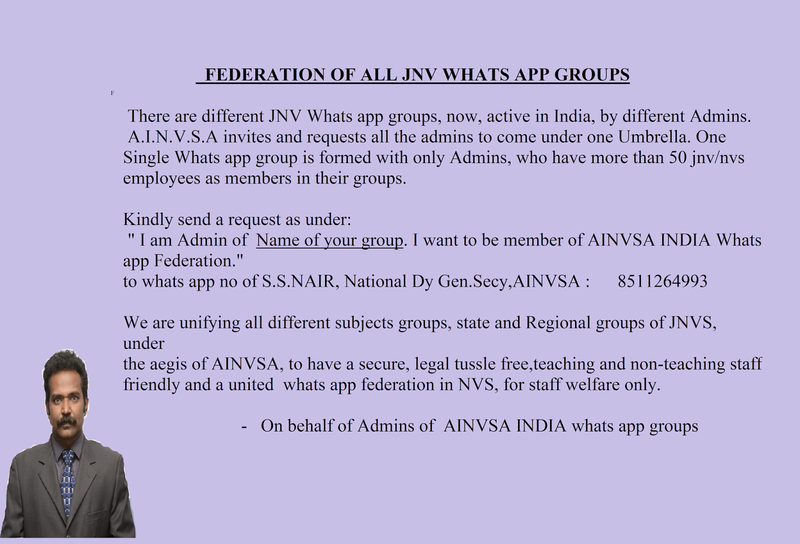 A.I.N.V.S.A Whats app groups crossed more than 400 active members....Hurry up! 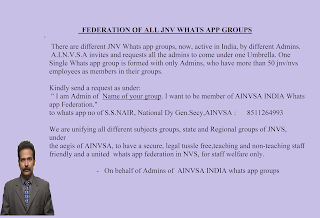 PLEASE READ BELOW : A.I.N.V.S.A forwards 14 points suggestion to NVS i.r.o Annual Transfer Drive 2016 for a pragmatic and just transfer , on behalf of JNV staff throughout India. 2. Central Counselling at a place such as JNV Ratibad,Bhopal Region, would ease the matter, and decrease the delay due to next vacant places options created subsequently in every category of transfers.. 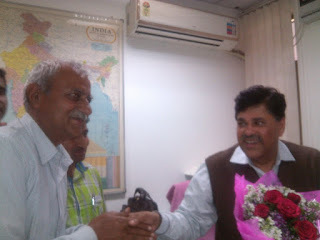 The transfer data should be brought to that central place... different computer system in different rooms.The transfer aspirants to ask orally, those resultant vacant places as per their choice. 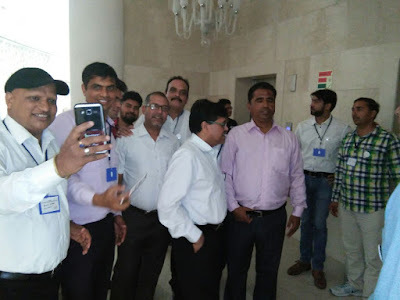 But based on the transfer counts and exception category etc and the authentic info displayed in the software, in respect of each employee, the choice places demanded subsequently to be allocated., if eligible. 3. The medical certificate to be examined thoroughly, before declaring the proposed list for Medical grounds transfer cases. 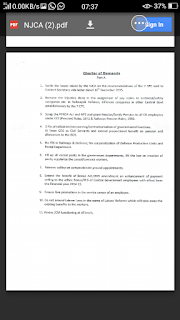 The discharge certificate and the case papers to be called forth...its reportedly alleged that fake certificates have been procured by a few employees just to get transfers on that ground. . While, a few to save themselves from the deemed vacancy have filled fake medical certificates of themselves or their family. Hence proper document verification is must for Medical case transfers...to get that previliges and only genuine cases to be considered or given that advantage. On the contrary disciplinary action to be initiated against those mavericks, and defaulters to curb this practice in future by any staff. 4. The spouse working in private firms have also been shown, though not working in that area. The Samvidha Sikhsak ( Contract teachers) of MP have tried to include in State Govt Spouses and an attempt to gain +5 points. Are those contract teachers of Madhya Pradesh State Govt to be considered at par with State Govt employees or not ,is not clear. Most probably not, but some of the JNVs have considered it as State Govt Spouses. Similarly, those working on contract basis for 11 months in any State Govt office or State Govt departments have attached the Certificate as Spouse working in State Govts to get those points...contract basis jobs in State Govt are not State govt employees at all. A few to save themselves from displacement due to deemed vacancy shown in their place, are getting certificates of their spouses working on contract basis of 11 months for medical officer or so , from Sarpanch and local political bodies. Whether on contract basis or regular basis should be clearly forced upon by NVS on those certificates. 5. 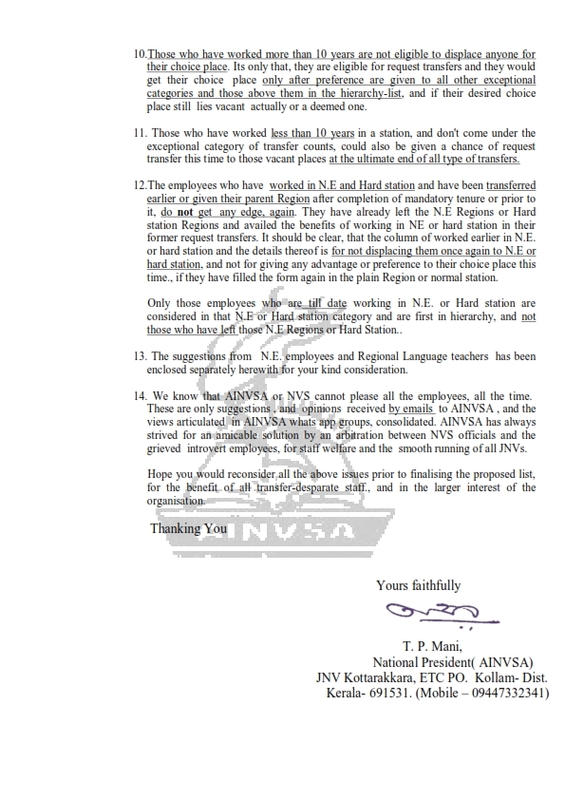 The employees who have worked in N.E and Hard station and have been transferred earlier or given their parent Region should not be given any edge,again. 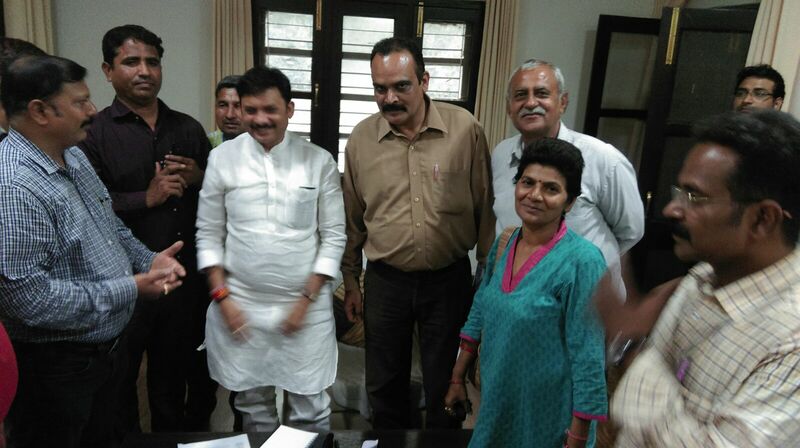 They have already availed the benefits of working in NE or hard station in their former request transfers. The column of worked earlier in N.E. or hard station and the details thereof is for not displacing them once again to N.E or hard station, and not for giving any advantage or preference to their choice place this time. 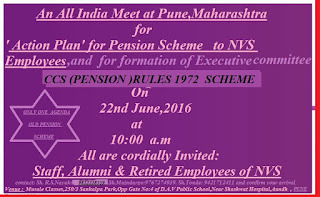 Only those employees who are till date working in N.E. or Hard station are considered in that category and are first in hierarchy, and not those who have left those Regions or Hard Station..
6.NVS have tried to accommodate even the spouses in the North East Region, saying that they should be ready to be unified at any place. But the D.O.P.T circulars clearly states that first priority should be to accommodate in each other's place of posting, or nearby places only... Couples have left the organisation for ever, due to this approach .Hence they should not be given an option to any far off place this time.. Deemed vacancies should be allotted to them as well , and the provision of displacement transfers executed in the Transfer Policy 2012 utilised optimum for their unification. 7. The Deemed vacancies should be certainly filled/allotted , as per the hierarchy only. 8. 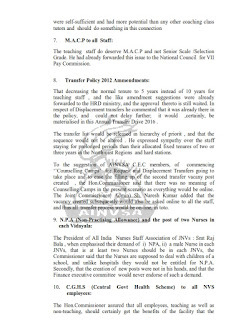 The transfer policy 2012 very well substantiates that displacement transfers would be done to bring in the N.E and hard station employees, for unification of spouses, for medical grounds transfer seeking employees etc... Hence no locus standi for those who have worked for more than ten years at a station. 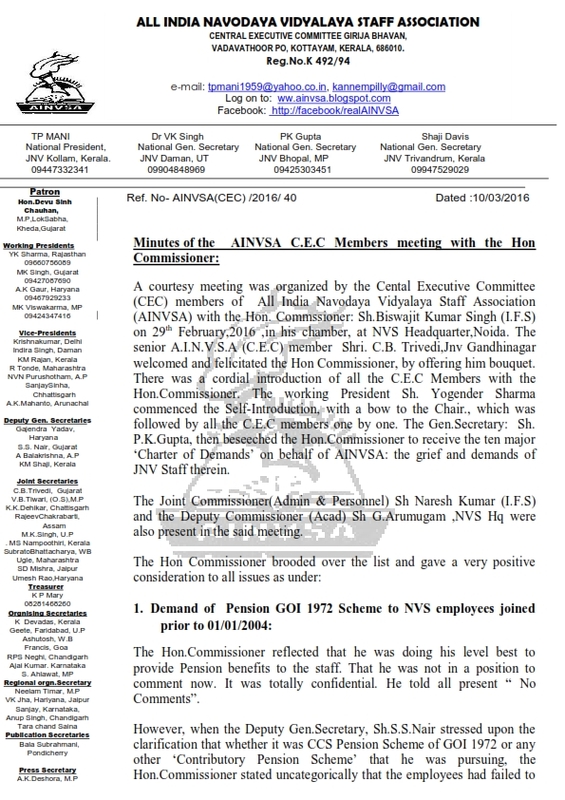 There is no clause that those displacements would be seniority wise, rather as per the demand of that coveted place and the incumbent there could be displaced though there may be seniors to him, in any other jnvs. 9 There are presently many employees working in their respective Home towns. They should also be displayed from their hometowns. The transfer data clearly displays it. These employees are trying to change their hometowns, or rather had tried their level best to change it on one pretext or the other. Suggestions have come from their competitors/rivals and could create hurdles by them, in future, if this injustice not meted out. 10.The tranfers from other Regions should be given priority to those in the same Region. The employees coming under deemed vacancies have filled their option as choice places to their nearby deemed vacant places . This would result in mutual transfer sort of thing, if they are given those places...initially. Hence their preference should be taken into consideration only after giving to those priority wise of category decided earlier, and after those inter Region transfers; then only intra- Region be considered. 11. 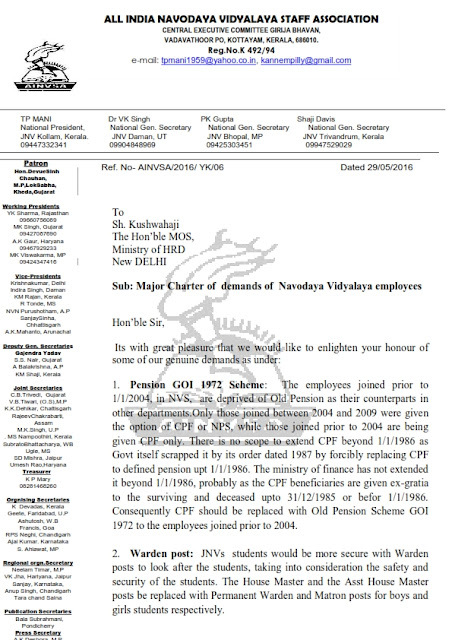 The deemed vacancy employees should be given a chance , if their desired place is vacant anywhere after allotting everyone as above. Those who have not filled any option should be taken seriously for displacements as per NVS choice or as per the place decided in the said circular, while the remaining should be given their request choice place if it is vacant at the end. 12. 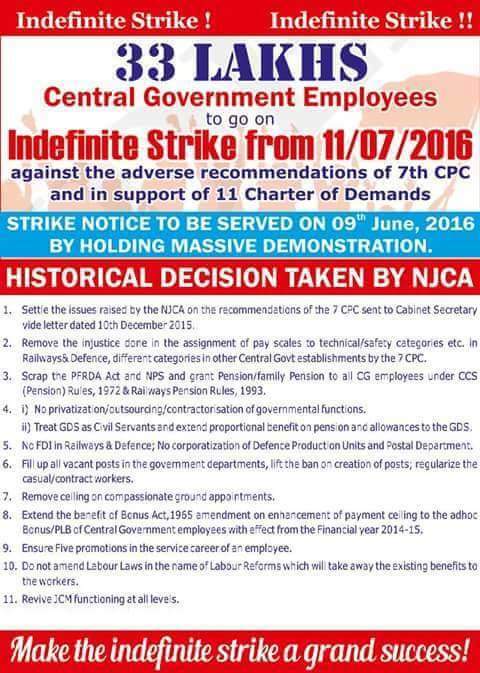 Those who have worked more than 10 years are not eligible to displace anyone for their choice place. Its only that, they are eligible for request transfers and they would get their choice place only after preference are given to all other categories, and if their desired place still lies vacant actually or deemed one. 13. Those who have worked less than 10 years in a station, and don't come under the exceptional category of transfer counts, should also be given a chance of request transfer this time to those vacant places at the ultimate end of all type of transfers. 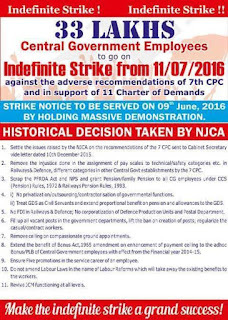 1.As the cut off date for counting the service tenure or mandatory stay was 01/01/2016. .. Some NE people were not able to fill the forms, however later on a circular was passed by NVS giving them the permission to fill the forms, but the transfer would materialise only after May or June... whenever they complete their 10 year tenure. 2. They have already filled the forms and choice places opted, the transfer data also displayed. 3. Now a proposed list also should come along with all. 4. Then when no errors found the final list also, with the statement that they would be relieved only after their ten years is complete as per their date of joining... in those areas. 5. 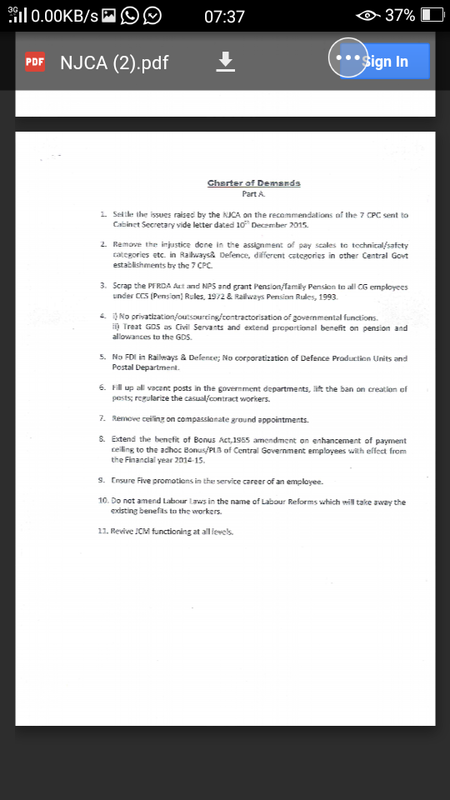 The TRANSFER ORDER to be given separately to those 10 yr bond employees , in the same way, just like the Regional language teachers were given exclusively afterwards when all others were given. The same procedure as some above could be done, and the five year tenure should be counted from their date of joining to the migration place, and relieved in that month. So that he need not stay for one more year , just because of a few months difference . If the month is mostly common a joint transfer order could be given in that month itself. But as above for NE, this transfer orders should be exclusively for Regional Language teachers...hence we cant expect the transfer orders of this category along with all. 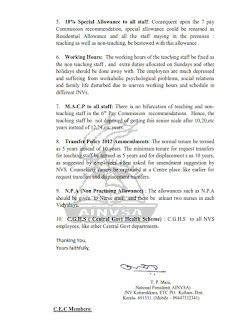 ---AINVSA comprises and infers a solution from the feedback received from the staff or rather interprets what NVS may execute to the staff.... to lessen their anxiety. 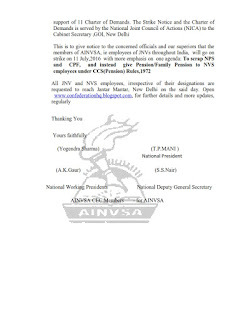 AINVSA appreciates NVS for uploading all the data on the official website as it would flaunt the Transparency, with full credit. 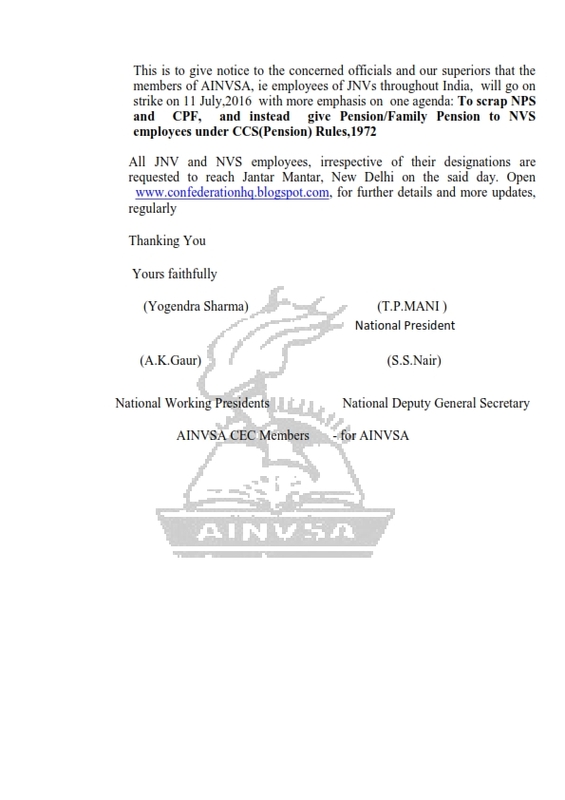 This would not amount to injustice to any employee, in respect of transfer matters. Otherwise nobody would have known why somebody is transferred and on what basis. The display of Transfer Counts is clear indication of transparency to be seen in this years transfers, except those category given exception from Transfer Counts, under NVS circular dated Dec 22,2015. 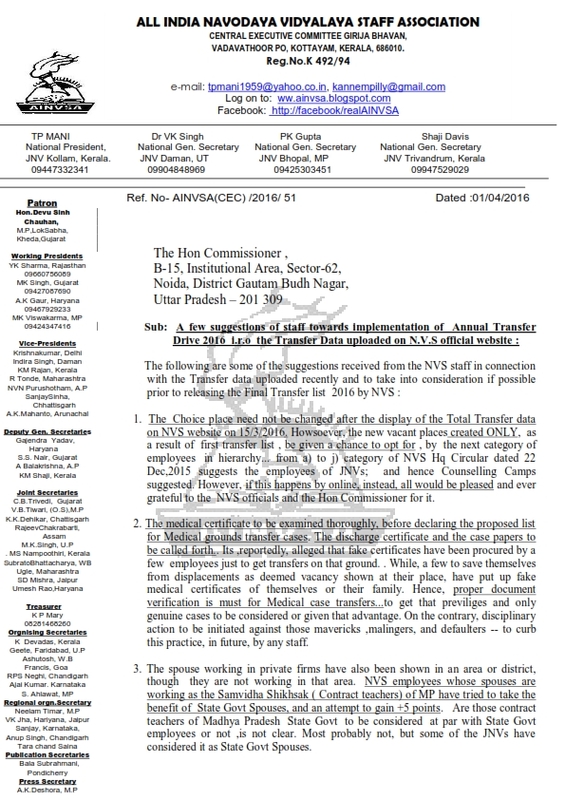 This data when once corrected by employees themselves, then Samiti would release the Proposed list and then final lists separately, one by one , in hierarchy as per the Priority Allocated earlier, a) to j) in the circular dated above. 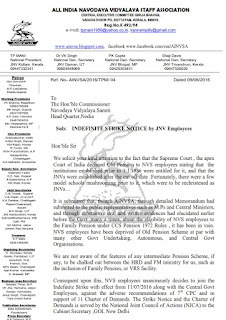 The deadline of such correction and forwarding by ROs is 21 March,2016. 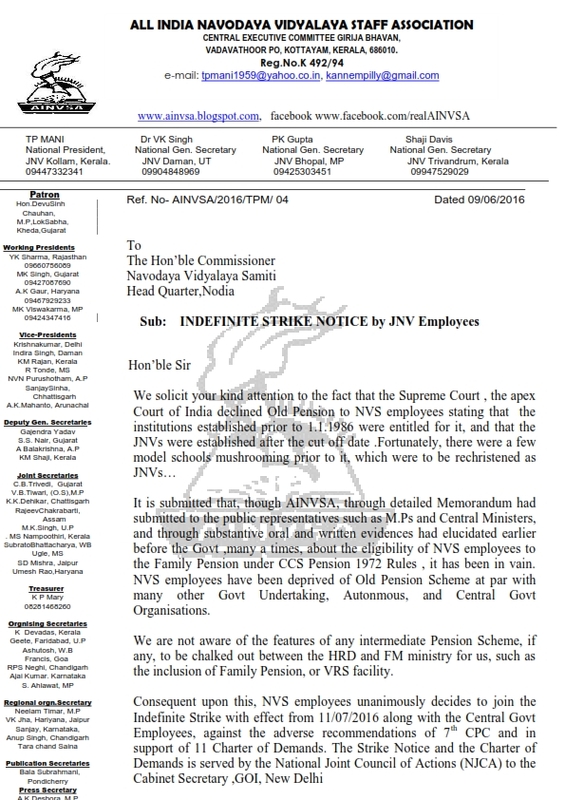 Hence the JNVs should compile the errors seen in their respective Vidyalayas and send the consolidated list to ROs at the earliest.There is no chance for change in their choice place now, except the error found different from their original hard copy transfer forms.. This period and opportunity is given only to rectify errors seen of their info such as date of joining , date of superannuation etc and not for changing any of their choice place. 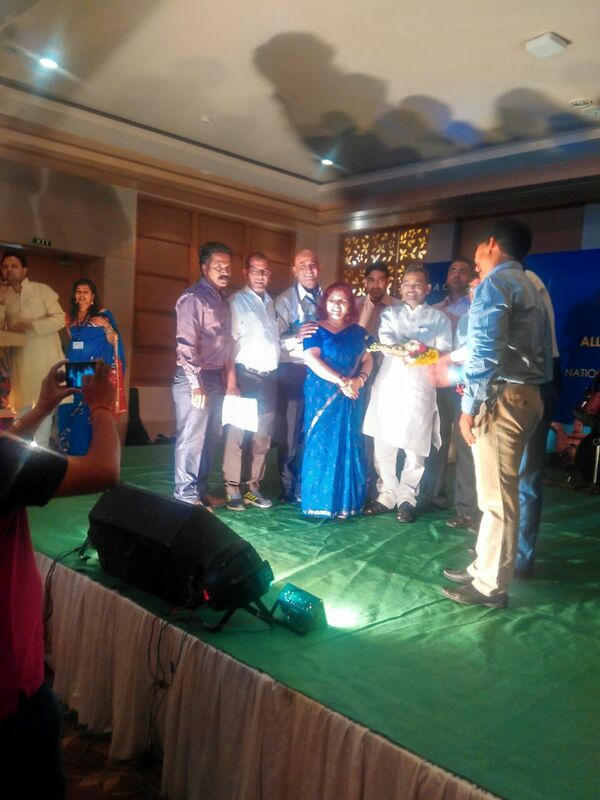 Then a proposed list would be released of a) differently abled categories FIRST by NVS. A little time given to see that their desired choice place has been allocated without any errors, and then the final list seen of that category. Similarly, all categories from a) to j).....The Proposed list should get rectified by 31 March,2016 as per the datesheet given. 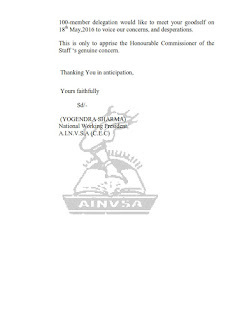 AINVSA uges all employees to cooperate , instead of finding faults now and then with NVS, by intimating through proper channel to R.Os the rectification to be made in their individual info. This is applicable also to those who have not applied this year, as this info would also be used for displacement transfers, public interest transfers etc to be done, even if you are not interested or not applied. This data would help the software to display the transfer list objectively, without any objectivity ,sides fear or favour, impartially. 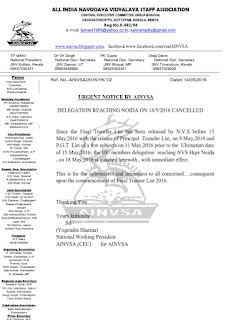 THUS, AINVSA INTERPRETS AND APPRECIATES NVS FOR THE TRANSFER DATA UPLOAD ON NVS WEBSITE ON 15 MARCH,2016 ITSELF ....AND HOPES THAT IT WOULD BE DONE AS ASSUMED ABOVE . 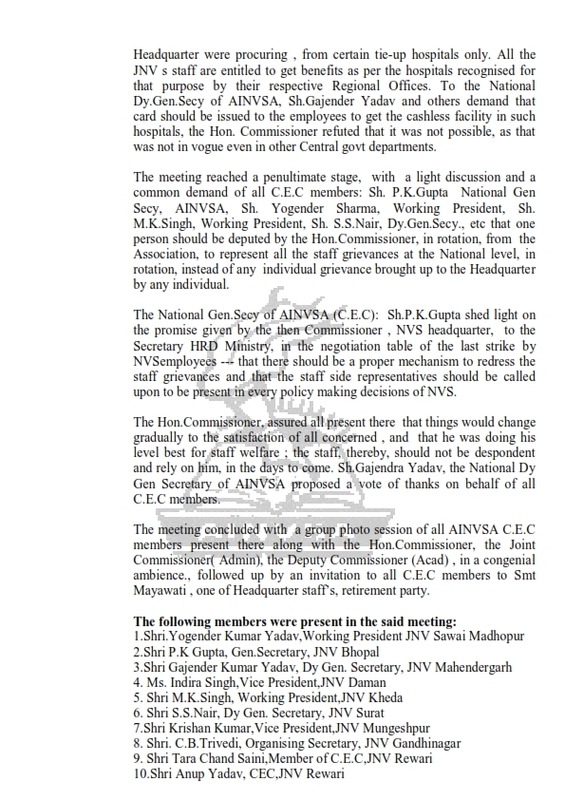 A Central Executive Committee of AINVSA is going to meet the Hon.Commissioner ,NVS Headquarter ,Noida on 29/ 02/ 2016 in the Forenoon .A C.E.C Meeting will be convened on the same date 29 Feb,2016 in the evening, at South Avenue,New Delhi : residence of Sh.DevuiSinh Chauhan, Lok Sabha MP, Gujarat, national patron of AINVSA briefing his honour of our genuine demands and issues like CCS Pension GOI 1972, regarding recognition of AINVSA..etc . 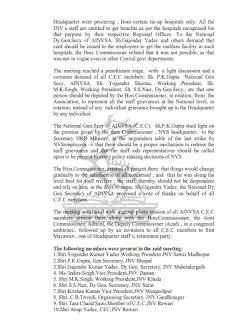 Consequent upon this, all the CEC Members of AINVSA are requested to attend the aforesaid meetings positively. 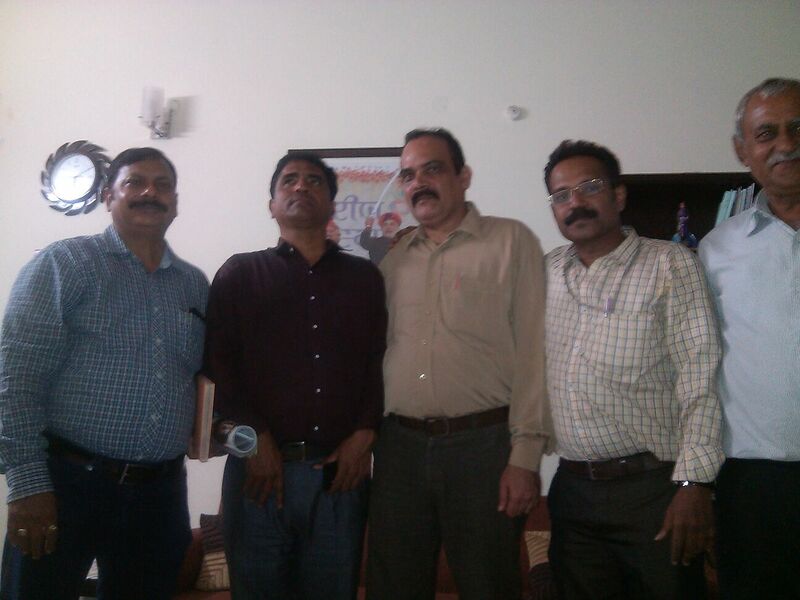 JNV Kottarakkara, ETC PO. Kollam- Dist.